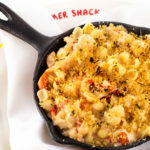 Inspired by the New England's coastal shacks, Jasper White's Summer Shack has been referred to as "a clam shack on steroids". The bustling, spacious restaurant, with locations in Cambridge, Back Bay and at the Mohegan Sun Casino in Uncasville, Connecticut, is a casual, roll-up-your-sleeves kind of place. The menu is laden with New England-sourced seafood with plenty of live lobsters, crab, raw bar, fried and grilled seafood, as well as family favorites like hot dogs, steak, fried chicken and other fun, delicious foods.